Briggs Chaney's garden apartments were meant to provide peace and quiet. 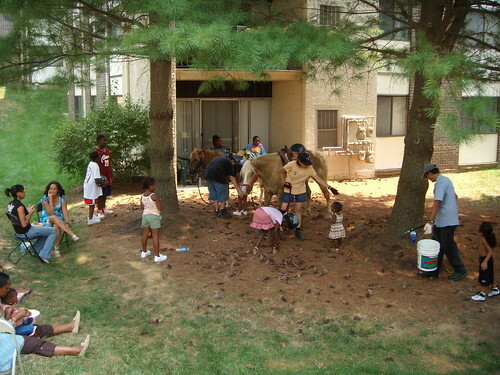 So why don't residents don't feel safe enough to let their kids play outside? After two women were murdered on Castle Boulevard last month, should residents be afraid to leave their homes? Police Lieutenant Stephen D'Ovidio doesn't think so. "Look at Southeast D.C., those places have murders there every day and people still live their lives," he said. "I'm not trying to say there's nothing going on at Castle Boulevard, ... but during the day, I don't see it as being that bad. It's a difference in perception." That's what he told the Gazette this week after Greencastle Elementary School, many of whose students live along Castle Boulevard in Briggs Chaney, didn't participate in International Walk to School Day October 7. According to Principal Andrew Winter, his students aren't allowed to play outside and his teachers are afraid to be at school after dark. It's disappointing that kids living in a neighborhood within walking distance of a school don't feel comfortable walking there. This creates a huge burden for the community: the extra cost of buses to carry students who'd otherwise walk; increased obesity as kids are forced to stay inside, deprived of physical activity; and a deteriorating sense of community as people feel they can't trust their neighbors and move away as soon as they can afford to. Garden apartments were built through the mid-to-late 20th century with the best of intentions: providing a place where young professionals and families alike could affordably live in a suburban setting. But this didn't take into account the fact that the spread-out, disconnected layout of suburbia isn't sustainable at higher densities. As it's currently laid out, the Briggs Chaney area creates traffic and encourages crime. It's not density; it's design. A concentration of rental housing creates a revolving door of tenants who aren't wedded to the community. 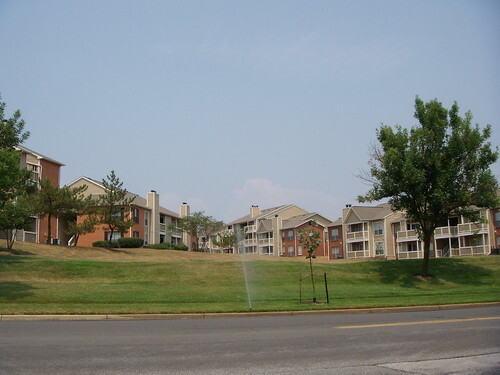 The neighborhood is Balkanized into dozens of self-contained apartment complexes whose residents are physically and psychologically isolated from one another with fences and a lack of road connections. Groups of apartment buildings with no defined public and private spaces make it easy for ne'er-do-wells to prey on unsuspecting residents. This is a place where people don't feel a sense of commitment because the built environment says they don't have need to. Residents would feel safer if there were more people outside, like during the East County Community Day, but are discouraged by concerns about safety. It's also hard to improve conditions across the community because residents are represented by landlords and management offices, not civic organizations. When someone does try to create change - like Dexter Price, a leasing agent and self-defined "activist" at the Windsor Court and Tower Apartments who organized the East County Community Day celebrations - it's usually limited to one complex and ends if the individuals involved switch jobs. And whether or not reports of crime in Briggs Chaney really make it a less safe place to live, the resulting fear affects everyone, not just those who live there. My brother, who goes to the adjacent Galway Elementary School, where principal Shahid Muhammad says students "do not feel unsafe in their neighborhood." We don't live in Briggs Chaney, but our parents are concerned about crime enough to have my brother ride the bus a mile to school. Most of East County's community leaders are preoccupied with preventing another Briggs Chaney from happening; i.e., keeping more apartments or affordable housing from being built. But that doesn't really address the issue of what to do with people who already live here and have to deal with a neighborhood that's designed to work against them. Making kids and adults alike feel safe in Briggs Chaney goes much farther than hiring a few more police officers, but the benefits of doing so will be felt all across East County. "According to Principal Andrew Winter, his students aren't allowed to play outside..."
Wow! Aren't students supervised by their teachers during recess any more, and are they really afraid to let children use their own playground during school hours with teachers present? We have become a community of cowards. This is letting histerical fear take over our lives. This area has a history of high crime and related activities. It appears that there is a section of homes and apartments within the Briggs Chaney/Greencastle area that attracts this criminal element. Dan, to some degree you are re-hashing what we discovered in Aspen Hill hen we first started out with former Lt Gov. Kathleen Kennedy Townsend's "hot spots" anti-crime program. For example, see an early page I did on the same subject, and look at the section labelled Geographic Isolation Characteristics of these Neighborhoods. While not so annotatedly googlemapped, we saw the same things back in 2001-2002 when we started up the Mid County Neighborhood Initiative effort for Aspen Hill. One thing that we discovered was that while the majority of people were pretty transient, a strong but small minority were hanging on year after year, and these were the people to find if you want to make a change. Also, involving property managers is essential. Anyone wishing to come and get some "lessons learned" should ideally be elected officials or their delegates, or property managers or other empowered stakeholders, and they should contact Lt Edward Harhai of the Fourth District police (Wheaton Glenmont). See also some information on the King Sector Community Advisory Meetings. This is separate from, but highly linked to the CSAFE/MCNI group meetings which are the descendant organization from the MCNI. We found that cleaning up North Gate Park and organizing a "National Night Out Against Crime" was helpful, especially the bit about cleaning up the Park. We had that same problem with parents isolating their kids afterschool, and creating a safe all-ages playground and getting non-criminal adults to populate it was key to getting people out of their houses. Afterschool programs for the kids had comparable effects. Probably the police commander in that district ought to talk to Lt Harhai who can steer him to all of the activists and officials involved. A lot of this was organized out of the mid-county center on Reedie Drive, so that should give you more clues. How things have changed. Way back when I attended Galway, I walked to school and never gave it a thought. In fact, some of us to the west of the school occasionally cut through the woods (now called Galway Woods, according to Google Maps) as a scenic shortcut. I walked that trail completely alone as a 5th grader. Not sure that's advisable anymore. Why can't the kids play on school property during school hours? That's just... ridiculous.